As we move into the final quarter of the year a new earnings season is on the horizon. The overall market has been resilient through the year, and the upcoming earnings season will help determine whether or not the market carries its recent strength through the remainder of the year, or it we see profit taking drive the overall markets lower through the final months of 2018. 2018 has been a little shaky. Rising interest rates, high oil prices, and trade tensions between the U.S. and China have all had a hand in the market’s uncertainty, but traders have managed to shrug off each threat and drive the major indexes to record levels. 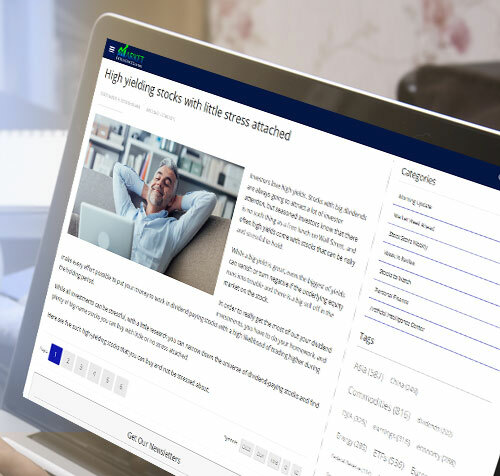 This week marks the start of the new earnings season, with a string of reports from the financial sector kicking things off and setting the tone for the rest of the season. Financials are arguably in the best position to benefit from rising interest rates so we can expect to see good earnings growth from the big banks as they release their quarterly numbers. Over the next two weeks there will be a lot of big names reporting, but this week will really set the tone for the market over the next month. Here are five big earnings report to watch this week. U.S. airliner Delta Air Lines (DAL) will report its third-quarter numbers before the market open October 11. The concern with Delta is the degree to which high oil prices are impacting the bottom line. All transportation stocks are vulnerable to high energy prices, but the airline sector is particularly vulnerable. Crude prices have been moving higher over the last year, with WTI Crude up 50% over the last twelve months and gaining 15% over the last six weeks. Over the last month we have seen selling pressure in DAL as oil has risen and the stakes are high with the company’s quarterly report. A disappointing result or weak forward guidance would result in more selling pressure and would ripple across the airline and other transportation sectors. Analysts expect earnings of $1.76 versus $1.57 during the same period last year. DAL trades at $51.87 with an average price target of $69.00. 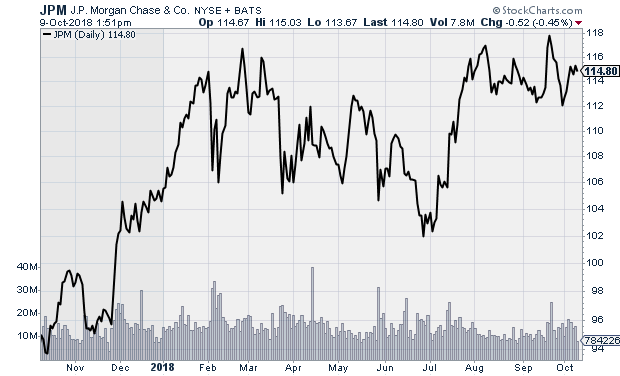 JP Morgan Chase (JPM) will kick the earnings season into high gear when it reports its quarterly numbers October 12. Rising interest rates should lead to strong earnings growth for banks, analysts are looking for JP Morgan to report year over year earnings growth of just under 27% versus the same period last year. JPM is the only major bank in the Dow Jones, so its report could have a major impact on the overall index and ETFs that track the major index. JPM has global banking exposure, so its quarterly numbers are a very important indicator of economic conditions not just in the U.S. but around the world. 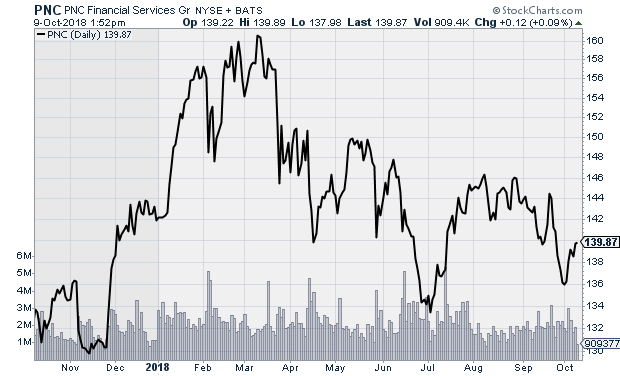 The company has posted 11 straight earnings beat, and traders expect that streak to continue. The street has a whisper number of $2.33, which would be a big beat versus the consensus $2.23. Several big banks will report on the same day, so any one of the banks could impact the entire sector, but JPM will have the biggest impact on the sector and overall market. The stock trades at $114.52 with an average price target of $125.15. 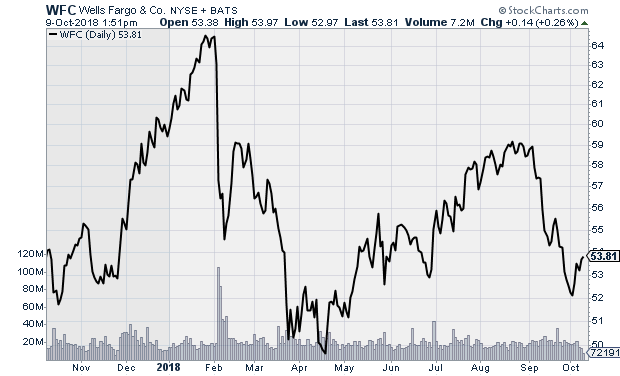 Wells Fargo (WFC) is another big bank that will garner a lot of attention when it reports quarterly numbers before the opening bell October 12. 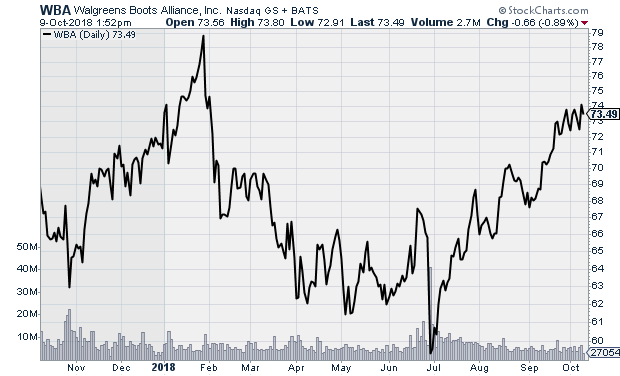 Wells Fargo has had a cloud hanging over it the last two years resulting from its multiple account fraud scandals, which has kept the stock from enjoying the level of gains most of the big banks have made during the same time period. Earnings growth has been muted, but that is expected to change moving forward. Over the last five years earnings have risen a modest 1% per annum, but profits are forecast to rise by 11% during the current year and 19% in 2019. As earnings start to grow enthusiasm should return to the stock assuming no additional scandals come to light, but the company will need to start doing a better job hitting its estimates. The bank has had a rocky earnings track record with earnings missing estimates four of the last seven quarters and sales falling short of estimates in six of the last seven quarters. The street is looking for a beat this quarter, with a whisper number of $1.20 versus the $1.17 consensus. During the same period last year, the company reported earnings of $0.84 per share. 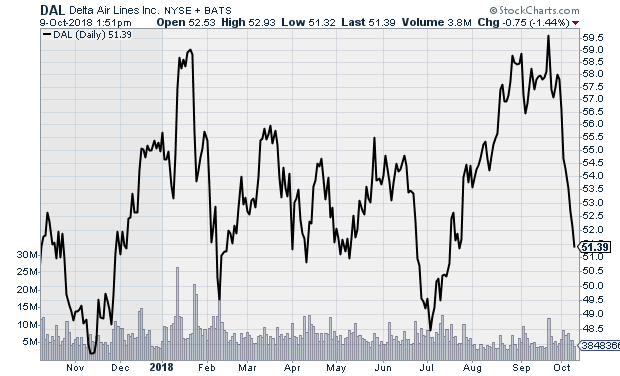 WFC trades at $53.93 with an average price target of $63.68. PNC Financial (PNC) is much smaller than the big banks that are also reporting on October 12, but its results are equally as important. PNC is a regional bank. Regional banks are more vulnerable to auto and housing markets since they rely more heavily on revenues generated through loans. While higher interest rates allow regional banks to widen the spread on money they loan out versus borrow there does come a point where rates will rise enough to have a material impact on housing which in turn would reduce mortgage applications. While rates remain very low, there are signs that the housing market is slowing. Sales growth is flattening, which could be a sign of worse things to come, and housing stocks have been hit hard in recent weeks. Overall economic conditions remain strong, which could lead to further rate hikes by the Federal Reserve. PNC is expected to post earnings of $2.72 versus $2.16 during the same period last year and the street has a whisper number of $2.75 for the quarter. PNC’s results will not have a huge impact on the big bank stocks, but it will set the tone for the rest of the regional banks that will report in the next couple of weeks. PNC trades at $139.60 with an average price target of $157.92. Drug store chain Walgreens Boots Alliance (WBA) will report its fiscal fourth-quarter results before the market open October 11. Analysts forecast earnings of $1.44 per share versus $1.31 during the same period last year. Walgreens recently completed its acquisition of around 2,000 Rite Aid (RAD) locations, and analysts are still looking for clues as to the impact the acquisition is having on the company. Over the summer the stock took a hit along with CVS Health (CVS) on news that Amazon (AMZN) was more aggressively entering the sector with its acquisition of PillPack, but both stocks quickly erased those losses as traders realized the hurdles Amazon will face and the long timeline it will likely require to disrupt the sector. The concerns have eased, but analysts will still pay close attention to script growth for the quarter. WBA has a solid track record of posting better than expected numbers, and the street expects another beat this quarter with a whisper number of $1.49 versus the consensus $1.44. WBA trades at $73.43 with an average price target of $74.24. Michael Fowlkes is a financial writer who has been with the Fresh Brewed Media family since 2004. Over the course of his tenure with Fresh Brewed Media, he has worn many hats, including portfolio manager, options analyst, and writer. Michael received his undergraduate degree from Virginia Tech in Accounting and got his start in finance working as a stock trader for six years at Chase Investment Counsel in Charlottesville, Va.